‘I recommend that he go’ or ‘I recommend that he goes’? Answer: The correct usage is ‘John recommends that Mary talk to the supervisor’, but I am not sure that it matters much. The reason the verb does not take an ‘s’ is because this construction is what is known as the mandative subjunctive (also known as the mandatory subjunctive). The mandative subjunctive is used with clauses that usually, but not always, begin with that and express a demand, requirement, request, recommendation or suggestion. It is indicated by the use of the base form of the verb (love, skip, jump) with singular subjects. I demand that he pay his share. The subjunctive is not used much these days, but it still has a place in the language with sentences beginning with if, as if, as though. Its construction often uses the verb were instead of was. If I were you, I would vote. 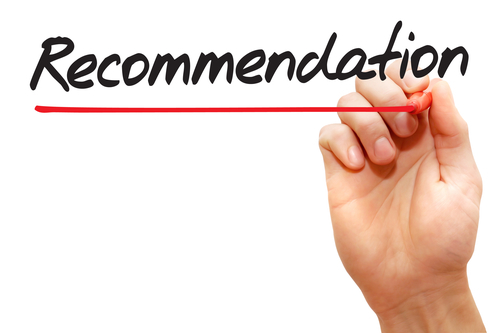 Read my blog about the mandative subjunctive in recommendations. Register for my online Grammar, Punctuation and Usage course.